Semele just may be my favorite Handel opera. By then he had been in England so long the English had begun to rub off on him, and this influence flowered into "Oh sleep" and "Where e'er you walk", two dreamily gorgeous songs in the English style. After writing so many oratorios, he had begun to feel that a chorus here and there would break up the monotony of aria and recitative. And the plot is so wonderfully juicy. Jove whisks his darling off to a newly built castle in the mountains and showers her with presents, leaving his wife at home to fume. Zurich Opera got it right. It is exactly like a story from the tabloids--like Brad running off with Angelina. It worked in New York as a semi-serious scandal, and it works here as something like a slapstick comedy. Iris, Juno's servant, played to perfection by Isabel Rey, is the comic sidekick, kicked around the stage by her mistress and constantly getting into trouble. I begin to wonder if it mightn't be Handel's only opera buffa--especially when Semele herself is also played as buffa by Cecilia Bartoli. She continues to present the most spectacular detailing in the coloratura that we've ever heard. 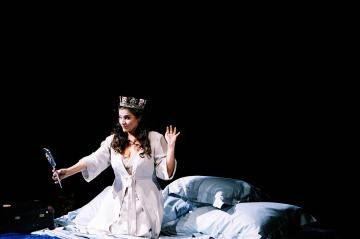 I know I said Anna Netrebko was the most athletic singer I've ever seen, but that was before I saw Cecilia in mid cadenza in "Should I persist in gazing" bouncing up and down on the bed. It was a Cecilia Bartoli moment. The entire aria was a complete tour de force I hope I never forget. Each phrase was a masterpiece, a miracle of phrasing and not merely one of comic genius. The giant Birgit Memmert in the role of Juno loomed over her Iris and was at once dramatic and funny. They didn't combine the roles of Ino and Juno in one singer as they did in New York, but then they didn't have Vivika Genaux either. 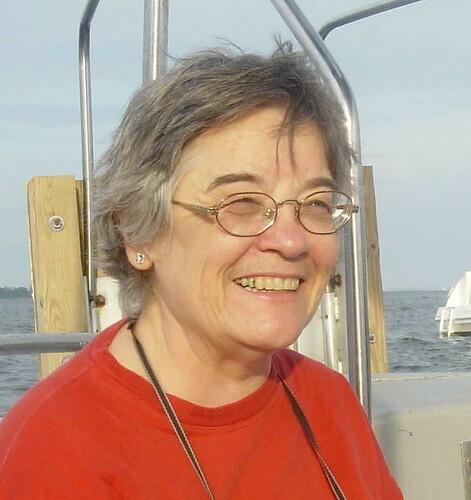 Liliana Nikiteanu was a lyrical Ino, and Charles Workman's Jupiter was also fine. One nice comic bit worth mentioning was the staging of the search for Somnus whom Juno wants to put Jupiter's guard dogs to sleep. He is lost in a crowd of sleeping men, and Juno and Iris search in the dark with flashlights. Iris happily serves as his reward. Both productions, New York and Zurich, ended in the same way: Jove and not Apollo appears with Juno at the end. Jove finds a new girlfriend to replace Semele. It has to have this ending. The current trend in ornamenting the da capos was everywhere in evidence here. Cecilia's ornaments were particularly wild. Of course. What fun! It's possible it will come out later on DVD. 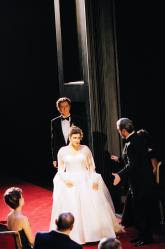 Cecilia Bartoli appeared at the beginning in a wedding dress. She is to be married to a man selected by her father. The omens for the marriage from Juno are good, but Semele pleads to Jove to rescue her from this marriage she does not want. Her sister also does not want it. This scene is dramatically but not musically interesting. Jove steps in and sweeps Semele off to a villa he has created for her. Cecilia then came out wrapped in a sheet to sing "Endless pleasure, endless love." This is one of the hit tunes of Semele, and was sung with great enthusiasm. Semele becomes discontent almost immediately. Jove leaves her alone at night and she sings the beautiful song (beautifully) "O sleep." To placate her Jove gives her stuff. One outfit she chooses to wear is currently being worn by someone else. 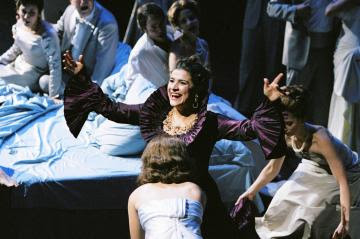 The opera is very sensual, and Cecilia projected a lot of sensuality in her voice, her manner, her body, her style. Time is spent keeping Semele happy. Chorus crowd the stage. Jove sings a love song to Semele "Where e'er you walk", one of the great pieces by Handel and one of the greatest love songs ever written. Finally Semele is seduced from her true path by the image of her own beauty. "Should I persist in gazing," a very funny song done in the style of a great virtuoso, both in the field of comic business and Handelian coloratura. Semele goes on to throw a tantrum immediately afterward. The role offers great scope for La Bartoli, offering her sweet songs, comic coloratura and an intense rage aria. The opera ends badly for Semele who is burned up by Jupiter's flame after briefly seeing the error of her ways. These photos are all borrowed from the Zurich opera. I hope they don't mind.